Is the Devil you were taught, Real? Discover the Shocking Biblical truth! Our book’s back blurb (CLICK TO ENLARGE) is very informative. This is a comprehensive study on the traditional Satan, the Devil vs. the Biblical. No stone is left unturned. How many times have we heard that our enemy is working against us to thwart God’s plan? We ask, who really is that enemy? Is it a supernatural fallen being, or is the Bible talking about human beings? opposing religious factions who oppressed those who believed in Christ. Adversary is also that fleshly inclination to protect self and justify wrong choices. Peter was certainly a follower of Christ but when confronted on it, he was sifted by that adversarial part in him that led him to deny the Christ. 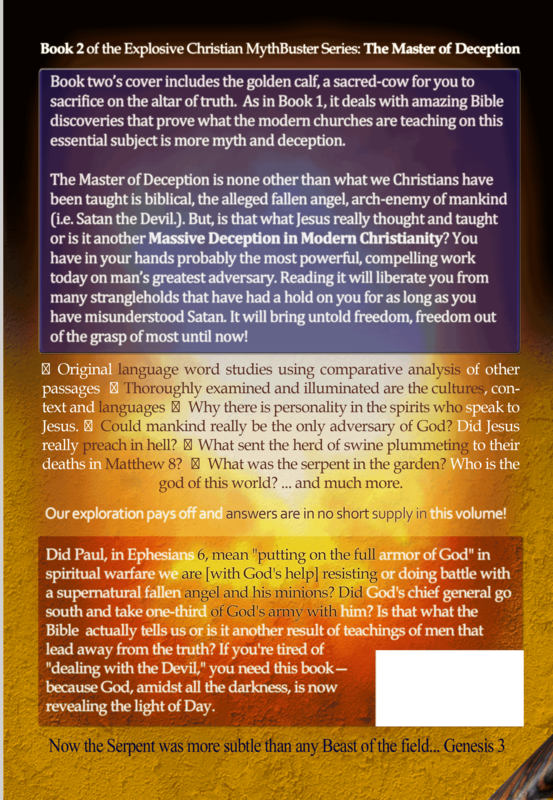 Book 2 – The Master of Deception will show you that the Real Devil who Jesus knew is not the same as what the churches teach today! That’s quite a statement given the passionate acceptance and devotion to such a teaching by the masses. This book has already brought many to amazing freedom! 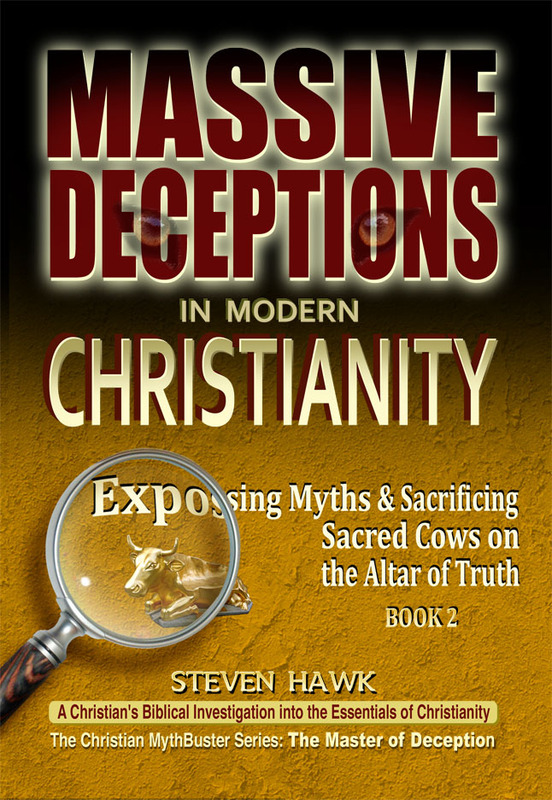 "Excellent book, be ready to shed the lies you've been taught! Throw out your Tim LaHaye, Thomas Ice and Hank Hannegraff books. This is the book to replace them ALL! I give it 10 out of 5 stars... Thanks Steven Hawk for writing this masterpiece!" "Clearing Away a Mass of Eschatological Debris"
"The Last Days Edition of The Christian Mythbuster Series is a must-have book of substance, unlike any book on prophecy." "It is so wonderful to have found your website, among others, which indeed are teaching truths our Father is revealing in our times! I am so encouraged to see the work you are doing and pray that many will find your site rewarding, revealing, and encouraging to spirits longing for truth, for answers, for "comfort of the scriptures" spoken of by the apostle. Pray you continue to burst the bubbles of deception, misconception, and lies we've been fed. I can only praise and be thankful to our Father in heaven for work such as yours that enlightens the mind, heart, and spirit of lovers/seekers of truth! May Yahweh bless your efforts continually." "By the way, over half way through Vol 1., lights going on all over the place... Super work by yourself and those involved with you. I don't see how it could not be of God." "You'll quickly realize Steven Hawk is a serious scholar and this is a serious book. I get the feeling Mr. Hawk would be very comfortable, and rightly so, debating any of the worlds top scholars on biblical exegesis. You can't go wrong with this book...it is never dull and the writing is aimed at the common man such as the Bible is written.... God has answered my prayers with your book. Finally EVERYTHING in the Bible makes complete sense. It all relates! I would highly recommend this book to all open minded Bible study groups and call it a must read for all who consider themselves honest teachers of God's Word." “I found your book to be very well written with very few English errors. Your knowledge of the Bible is well demonstrated. You have extensively cited references that give support to your arguments. Even though you said that your book could be used to change the views of some atheists that I know, I am extremely doubtful they would take time to read your book. What is said in your book immediately requires knowledge of the Bible, and such persons do not have this knowledge. Besides their minds are already made up that God is not the origin of the universe. Anyway, you have written a seminal book that is well worth considering."